If you are like most investors, you are cautious with your investments, you want a solid return on your investment, and you're not interested in the stress that high-risk investments bring. But most people have limited investment options. They may invest in bonds or fixed deposits, and get a return that may not even keep up with inflation. Or they may roll the dice in the stock market, buying bad stocks that not only burns a big hole in their pockets, but also sometimes leads them to financial distress. That does not sound like a profitable way to invest your hard-earned money, right? But we know of a better way to invest for prudent investors, one that helps them earn amazing long-term returns. This 'better way to invest' is something that many investors know of, and many investors use...but not to their best advantage. Yes, this 'better way to invest' is not something you wouldn't have heard of, but what we will reveal shortly will help you to look at this method of investing in an altogether different manner. Now before we share more, here's how investors have multiplied their wealth using this approach to investing. Let's not keep the secret away from you for long! You see, the 'better way to invest' that we talked about above is nothing but to "invest in market-beating mutual funds" that could work wonders for your wealth over the long term. The idea is to create solid portfolios of market-beating mutual funds that could help you achieve your long-term financial goals. Because it's only when you tie your means (creating portfolios of market-beating mutual funds) to your ends (your financial goals) that you can really achieve your financial freedom. Now you may ask, "But how do I find such mutual funds and create such goal-based portfolios? And, how do I know whether I already own such funds and portfolios?" Well, we are just coming to that! Our Brilliant Track Record of GeneratingMarket-Beating Returns for our Clients! You see, trust in investment advice has a direct correlation with the past performance of the advisor. And PersonalFN won't disappoint you on that front. Here is a chart that shows how the funds carefully selected by PersonalFN have worked wonders for the investors over almost past 15 years. That is how great funds can turn out to be. With an extra 75% in return, you could reap higher returns (read "a lot, lot higher"). For example, let us assume that you invested Rs 1 Lakh in our recommendations since June 2003. While the S&P BSE 200 index would have returned around Rs 10.22 Lakh, the funds chosen by PersonalFN would have returned a whopping Rs 17.91 Lakh - outperformance by around 75%! That means, by investing in funds recommended by PersonalFN, you could have earned around Rs 7.69 Lakh more on your investment of Rs 1 Lakh. Now let us take you through some specific mutual fund portfolio recommendations that have done wonders for our clients over the past decade. Like our Aggressive Portfolio recommended since July 2007 has multiplied investment for its investors by almost 3.8 times. Rs 100,000 invested in the portfolio then, has now become Rs 382,521. In sharp contrast to this, the S&P BSE 200 index has multiplied by around 2.6 times since July 2007. Indeed, the investors who have executed our recommendation have seen appreciation in their wealth invested in this portfolio, over a period. Then our recommended portfolio for Moderate-risk investors has been quite rewarding for our clients. Rs 100,000 invested then have more than tripled to Rs 340,008 in about ten and half years' time. Against this, the S&P BSE 200 index has managed to gain to just Rs 258,455 over this period. And, our experienced research team has been successful in identifying the best funds for long-term investors, which has helped us create such track records across our services. 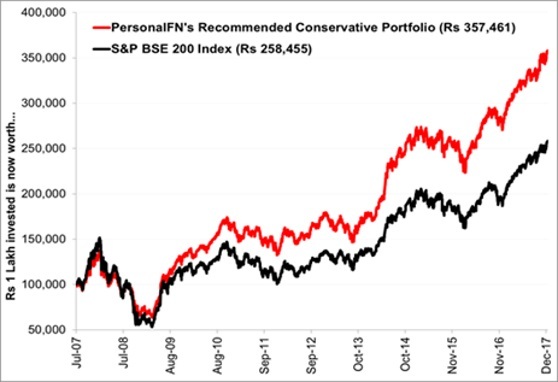 Or for that matter have a look at the performance of our recommended Conservative Portfolio. The portfolio has met our expectations and has managed to outpace the broader markets by a big margin of around 99% during the 10-year period. 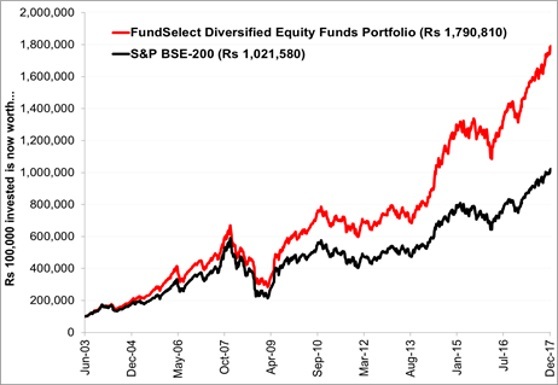 In a little over 10 years' time, Rs 100,000 invested in the portfolio has appreciated by over 257% and has become Rs 357,461. 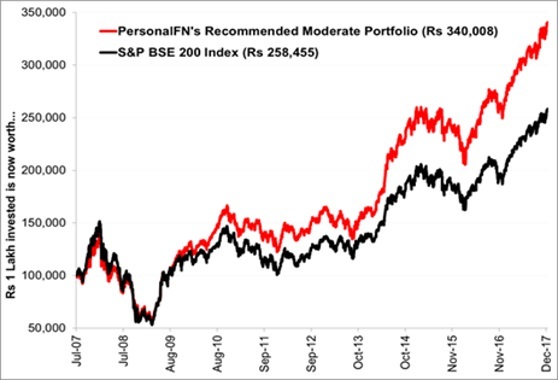 During the same period, the broader S&P BSE 200 index has appreciated by around 158%. Now for your big questions - "How do I identify such mutual funds that can help me grow my wealth strongly over the long term?" "And how do I know whether I already own such funds or not?"